If you’re a longtime Salesforce user, you know that linking or converting leads into existing accounts is a manual and painful process if done manually. If you want to learn how to automate this process, you have found the right article. Most Salesforce Administrators utilize other data transfer tools to upload their Lead, Contact, or Account lists. The primary issue with most other tools, is that they do not look for duplicate Leads, Contacts, or Accounts. Instead, they add all of the records from your file as NEW leads. This results in a HUGE data disaster! 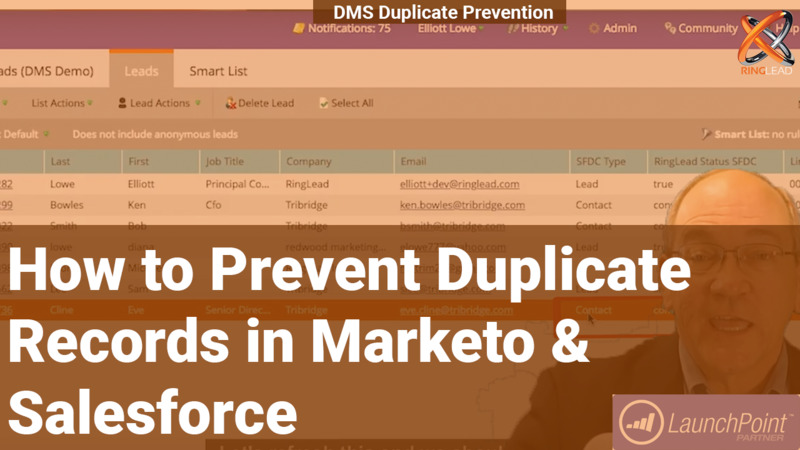 Instead of wasting your valuable time creating duplicates, you should try RingLead DMS Duplicate Prevention which features an automated data upload tool called List Import. List Import allows you to upload a list of Leads, Contacts, or Accounts without creating duplicates. You will also be able to auto convert or link leads to pre-existing accounts. On average, 40% of the people that vendors interact with at tradeshows are current clients. Another 10% are already in the opportunity funnel. Uploading a list of tradeshow attendees to CRM without preventing duplicates can be a disaster. It’s never nice when clients receive that “FREE IPAD” offer or discount code, especially if they didn’t get anything for signing up in the first place. Most marketers continuously strive to improve their metrics. Open rates, click rates, new leads, lead lifecycle, etc. Duplicates negatively impact marketing metrics by reducing open and click-through rates. They also inflate new lead metrics and skew lead lifecycle analytics. By linking Leads to Accounts any Account-Based Marketing (ABM) efforts are improved by utilizing all of the vital company information on the linked Account and making it available on the Lead. Duplicates are a burden on database storage. CRM and Marketing Automation products like Salesforce and Marketo charge by the number of records or total storage volume. One of the easiest ways to cut the cost of these expensive platforms is to de-dupe and prevent future duplicates using RingLead DMS Cleanse and Duplicate Prevention. Cleanse and Duplicate Prevention are only two products in the RingLead Data Management Solutions (DMS) lineup. DMS is the only cloud-based, fully scalable, data management platform that can capture, clean, protect, and enrich all of the data in your CRM in minutes, saving you time, money and stress. If you’d like to start linking leads to existing accounts and preventing list upload duplicates, schedule a demo of RingLead DMS Duplicate Prevention today to get a FREE trial of RingLead DMS!